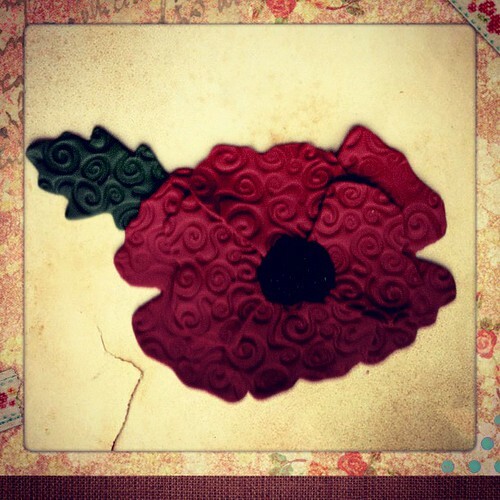 Poppies and their story have caught the household this week and another daughter got in on the act to produce this stunning piece of arty-crafty beauty. 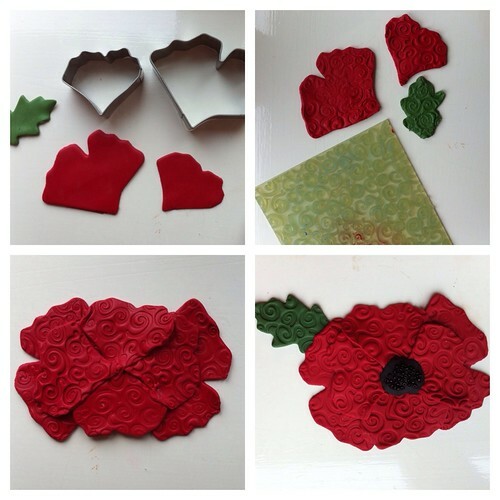 A really simple method produces a fabulous poppy flower from 3 colours of polymer clay and some seed beads. As you can see from the easy step by step below, we used cutters designed for petal shapes. However, it would be really easy to fashion these petals by hand or by gently moulding heart shape cut outs. The red sculpey is in 6 parts, 4 small petals and 2 large ones while the leaf is another cutter. If you don't have anything suitable, flatten out an oval bead shape of green fimo and then use the handle of a knife to gently make dents in the side. We used some sculpey texture plates to give it the pattern. These are lovely but you can easily recreate the effect. One way is to make a texture of squiggles in fimo and bake it, then press it into your petals, another is to use doilies or fabric to add pattern. The centre is a heart shape with tiny black seed beads pressed into it. This poppy was baked flat, but with some extra leaves and a second flower, this could easily make a loop around a vase or be mounted on a canvas covered picture frame as a picture.